Grated radish and ginger; they are my favorite foods. And recently grated garlic has also become a favorite. Sometimes the smell of garlic cooking comes into my house through the window from the neighborhood in the evening. so I enjoyed eating garlic cooking only on Sundays. 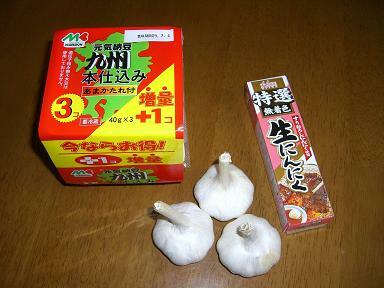 But one morning I tried to mix grated garlic from a tube into natto. Good smell, good taste and besides not such a strong smell. Yahoo! I'm crazy about natto with garlic.